Scott McIntires paintings hum with an energy and vibrancy. In many cases, the pieces do more than humthey crackle. The concentric circles and energy fields in his pieces add a kinetic feeling to his work, while providing a cohesive unity of space. These elements also give evidence to his superior skills with a brush, as well as his mastery as a color theorist. In his painting, Fat Man and Little Boy, McIntire depicts the Manhattan Theater, its marquee majestically reaching toward the heavens; the current film, Fat Man and Little Boy, a reference to the Manhattan Project and the bombs dropped over Hiroshima and Nagasaki. 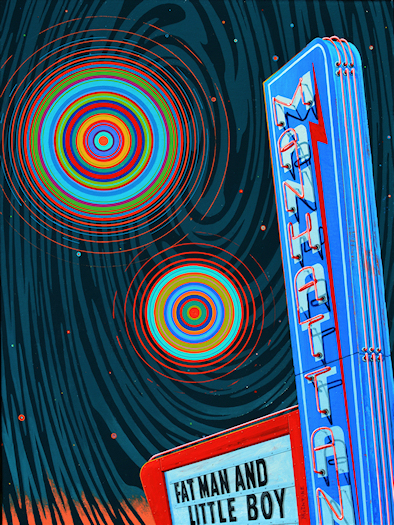 In the energized, nocturnal sky, two sets of concentric circles radiate outward, representing each detonation, while swirling energy fields roil and pulsate with a radioactive half-life in the backgroundthe cool blues becoming a fiery orange, as it dips toward the earth. In Attack of the 50ft Woman, McIntire plays with the palette. This painting also depicts a nocturnal scene, as Attack of the 50ft Woman plays on the drive-in movie screen, but the vivid warmth of the sky glows with the brilliant luminescence of daylight. The speakers emerging toward the foreground elicit the feeling of sound or music, as the kinetic energy dances in the backgroundthe concentric circles and energy fields evoking the excitement of cinematic experience and memories of a bygone era. Many of McIntires paintings are inspired by nature, often featuring man-made structures in the background. These structures are a poignant counterpoint to the images of animals, insects and flora that dominate the paintings, and draw attention to how increasingly difficult it can be to enjoy nature in its pristine state, without evidence of the modern world. 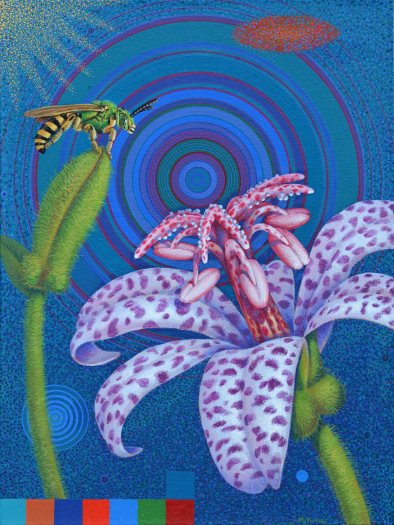 In his painting, Toad Lily and Metallic Green Bee, McIntire depicts a Metallic Green Bee (Agapostemon) preparing to pollinate a Toad Lily. The flower appears to lean toward the bee, its speckled petals open, revealing its receptive stigma to the poised and ready bee. The energy fields in the background suggest the ultraviolet light of the sun (used by bees to navigate), as well as the vibrancy of life and renewal. In his complex composition, In Search of Balance, McIntire paints a loose triptych of a deer, an electrical tower, and a human figure in a state of contemplation. The triptych is overlapped and connected by energy fields, a tree branch, and an orchid. This piece deftly pulls together McIntires themes, as the energy fields of nature and technology comingle. Rays of color radiate out from the figures mind, showing humanity as part of nature, but separated by our intellect. We are animals, but thinking animals. We are part of nature, but compelled to explore, innovate and modify the natural landscape. We appreciate the beauty of nature, and create our own beauty in the arts and sciences. We impact the natural world, as we endeavor to coexist within it, striving to preserve that which we innately hold dear. McIntires energy field paintings show us the splendor that surrounds us in our daily lives, from man-made structures to unspoiled nature, even in our own backyards; but his paintings also show us the invisible. McIntires energy fields give substance to the sounds of nature, leaf blowers and airplanes flying overhead. Photons, radio waves, cell phone signals and radiation are all made manifest; even memories and emotions are given shapereminding us of the unseen worlds that fill the spaces between our eyes and that which we perceive.